WILMINGTON, MA--(Marketwired - Mar 17, 2015) - Stafford Manufacturing Corp. stocks a standard line of shaft collars, couplings, and mounts developed to make it easier to design and build packaging machinery and systems. Many of these items evolved from special ordered parts over the years. Stafford Shaft Collars, Couplings and Mounts are available in a wide range of sizes, materials, and configurations to meet the challenges associated with building packaging machinery. Featuring over 3,600 standard items, the line includes collars and couplings, the Staff-Lok™ hinged collar which is easy to open-close and clamp by hand, and the Grip & Go™ handle that can convert a standard shaft collar into a rapidly adjustable locating device. Providing a rigid permanent stop, spacer, and shaft mount or an easily adjustable solution where required, Stafford Shaft Collars, Couplings and Mounts are made from aluminum, steel, stainless steel, and plastic in sizes from 1/4" to 6" O.D., depending upon the part and material. Collars come in one-, two-piece, and hinged designs, couplings in one-, two-, and three-piece, and a full range of options and finishes are available. Stafford Shaft Collars, Couplings and Mounts are priced according to type, material, size, and quantity. Price quotations are available upon request. Founded in 1975, Stafford Manufacturing Corp. is a leading manufacturer of shaft collars, couplings, and specialized mechanical drive and structural components. The company is recognized as a single source for all types of shaft collars and couplings including metrics. Their "Standard Series" features over 3,000 popular items which are in stock for immediate delivery, their "Signature Series" features premium quality collars and couplings manufactured in the USA, and their "Solution Series" with over 500 problem-solving components is a virtual mechanical design center for anyone involved in product and system development. In addition to their over 3,600 catalog parts, Stafford Manufacturing Corp. manufactures problem-solving parts for leading OEMs, contract manufacturers, and numerous industrial distributors. Their well-engineered design solutions can be found in all types of equipment including conveyors, packaging machinery, processing equipment, recreational products, medical instruments, and consumer goods. Stafford Manufacturing is ISO 9001:2008 Certified. 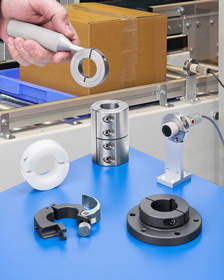 About this company Stafford Manufacturing Corp.
Stafford stocks over 3,600 standard shaft collars, couplings, and mounts developed to make it easier to design and build packaging machinery and systems.